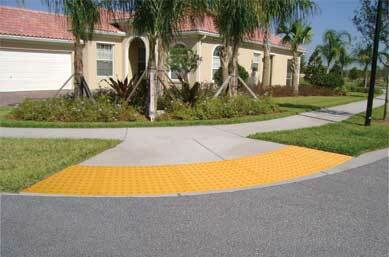 RediMat - Detectable Warning Mat | Alpine Products, Inc. The SURFACE APPLIED RediMat™ is molded from extremely durable UV protected polyurethane and uses an exclusive peel-and-stick backing and stainless steel anchoring system. Its flexible construction and 10 minute installation make it the mat of choice for retrofit applications. The slip-resistant RediMat is available in the “in-line” or square pattern as recommended in the PROWAAC Final Report as well as the original offset pattern required by ADAAG. 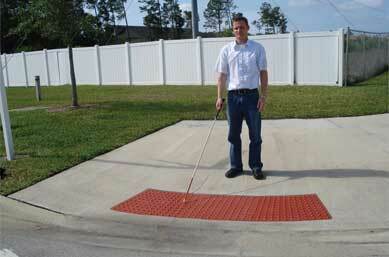 The 2.35″ inline spacing of the domes in a square pattern and beveled edges allow for improved access by wheelchair users. FAST – Install each RediMat in less than 10 minutes with a simple five step process. Just place, peel, roll, anchor and seal. The Redi-Mat is the most installer-friendly mat in the industry! 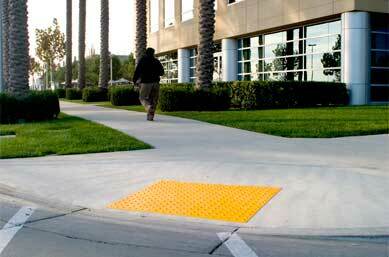 DURABLE – Molded from tough, long lasting, UV protected polyurethane, the RediMat is ideal for years of high volume foot traffic on curb ramps, hazardous vehicular areas and transit platforms. 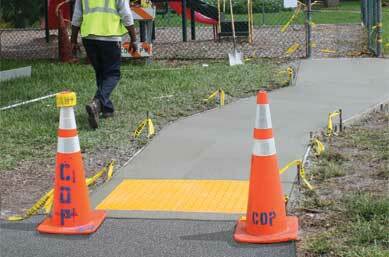 ADAPTABLE – The semi-rigid material allows the RediMat to conform to existing curb ramp contours and to adapt to the normal variations on concrete sidewalks. 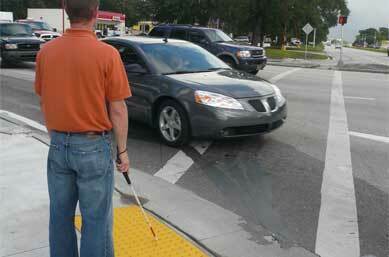 They can be easily cut on the job site to adapt to many special situations. The RediMat is also available in an exclusive “wedge” shape for fast and accurate installations on complex radius applications.